Well drivers, it’s been ah long 2+ years of talks from SCS about a new updated U.S. version to their smash hit Euro Truck Simulator 2 and today all the talking is over, it’s finally here, American Truck Simulator in all it’s splendor! 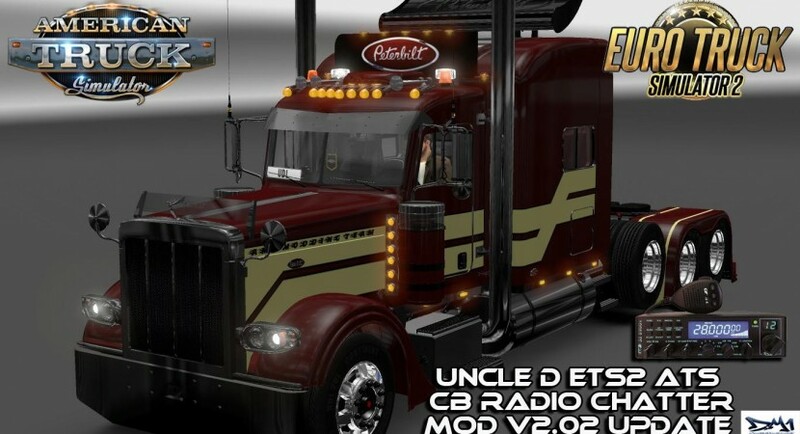 So as I promised to you drivers on the day of the release of ATS we’re going all new too here at Uncle D Studios with all new CB Radio Chatter Mods for our U.S. virtual roads! 1st mod to roll down these roads is V2.02 so I hope you drivers enjoy it and the many more to come as we build our USA virtual trucking companies together! The mod is simple to install, copy and paste the mp3 file to your ATS music folder NOT MOD FOLDER, and turn it on in your sim radio player and go. Hope you U.S. drivers out there enjoy them, and S/O’s to all the other hot mod makers out there in the Euro Truck Simulator 2 & American Truck Simulator community world!